Ticket dispenser (a) used in film shows by the Amenities Committee in West Church Hall, 1945-1960. Contains rolls of 1, 2 and 3 shilling tickets. The dispenser is a black cylindrical box which opens in half to reveal 3 rolls of tickets on a metal spool, separated by metal discs. A 4th roll is loose. A metal handle is soldered on the outside and a securing chain is attached. 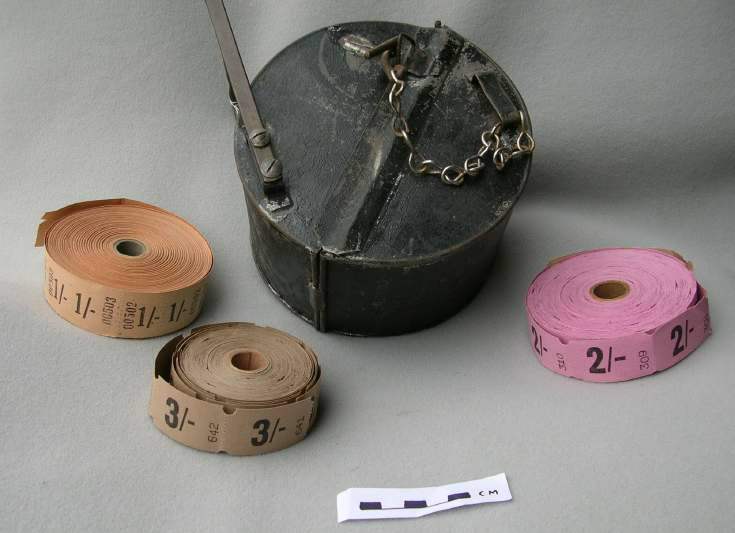 The tickets are peach 1 shilling (b), pink 2 shilling (c), buff 3 shilling (d) and orange unpriced (e), numbered, of cloakroom type, with the prices in black lettering.